Download-instructions: Click on the download link and click on "Save as" . When the download is complete open the winzip file and extract to "../Zoo Tycoon/Updates/"
New! this is the EMU created by Jeremy Muldune, the genius behind the Albino Giraffe. 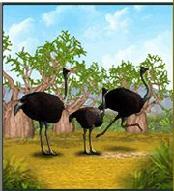 He has granted us permission to make the Emu available here for you to download! Enjoy! New! Here is the DOLPHIN created by Silver Wolf who has so graciously given us permission to post this wonderful addition to the Zoo Tycoon world! Download and Enjoy!